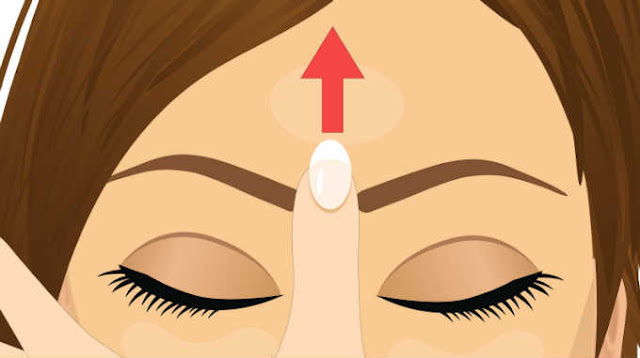 A simple acupressure self-massage at this point on your forehead can have amazing results. We all have a tendency to rub our heads near the temples or our neck when we have a tension headache. The same is true for when you feel sinus pressure. Rubbing gently or applying pressure is something we do instinctively to try to help with pain. Empowering yourself to treat your own ailments is powerful. When we can heal ourselves, we release the need to be controlled by modern medicine, which seems to more and more use the pattern of intake, medicate, and bill. Acupressure, acupuncture and reflexology are all non-invasive, non-Western medicinal ways to help us feel better. We can learn from the techniques of Traditional Chinese and Ayurvedic medicine and applying these techniques will help us heal ourselves. How do we know that massaging a point on the forehead will have any affect on our level of pain, health, or the workings of our inner body? Scientists can use an MRI scan to look for activity in other parts of the body while one area is stimulated with pressure or massage. In other words, pressing a reflexology point works to stimulate another area of your body. Based on this research of the pressure points on the foot, we can say that the same is true for pressure points on the face, hands, and body. We have discussed the energy meridians of the body in other articles. See ‘Here’s What Happens When You Tap These Points On Your Body’ for more acupressure points and self-massage information for weight loss, anxiety and more. The governing meridian runs down the center of the face and the forehead, which is the area we are focusing on. When you touch the surface of the skin on the forehead, you activate the energy center under the skin. Gentle pressure (about what you would use to press and elevator button) can activate the flow of previously blocked energy to restore balance. Energy gets blocked due to physical and emotional trauma that we have experienced. According to traditional Chinese medicine, the energy flow is necessary for good circulation and all of our bodily functions. Massaging and applying pressure to energy meridians in the forehead can improve your circulation, reduce muscle tension and stimulate your brain function. Yang energy is what we are working with when you massage this point on your forehead. The energy begins in the head and flows downward to the rest of the body. The point on your forehead that you will be working with is called the Third Eye Point. In Traditional Chinese Medicine this point is called GV 24 and the GV stands for Governor Vessel. It is located between the eyebrows, slightly above the upper bridge of the nose meets the forehead. Applying pressure to this point on the forehead helps improve concentration, relieves headaches, and can also help with eye strain if you are at a computer for many hours a day. According to Traditional Chinese Medicine, massaging this point can also help to strengthen your sense of intuition. Apply pressure to the point between your eyebrows for 45 seconds – 1 minute to experience the benefits of this point on the forehead. You can also use gentle pressure to stroke or massage the place from between your eyebrows to three inches above that point in a vertical line. Researchers studying noninvasive beauty procedures found that the rejuvenating effects of reflexology to points on the forehead and face helped prevent wrinkles. The researchers say ‘This procedure activates one of the brain centers, amygdala nucleus, which affects the human lymphatic system causing elimination of nervous tension and helping removal of the negative metabolism products. Moreover, this procedure efficiently counteracts creation of new wrinkles, facilitates blood and lymph flow (prevents swelling), makes the skin excellently firm, corrects the eye and mouth corners and activates regeneration processes (e.g. after a surgery). This post was republished from www.powerofpositivity.com You can find the original post here.